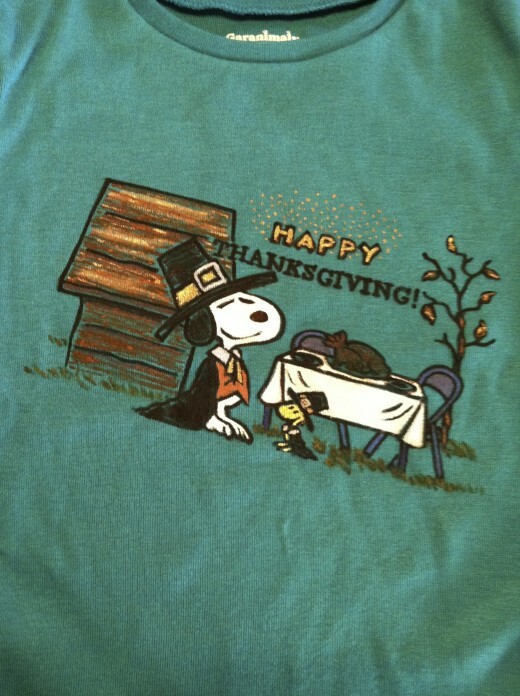 If you are familiar with my previous tee shirt hubs for kids then you know how much fun I have creating something special around holidays for my grandchildren. Hopefully, my work will give them a big smile, and, at the very least, they will have a little extra hug of love from their Grandmama during Thanksgiving's season. • Draw or copy your design. • Take a photo and upload it to your computer if it isn't already there. • Flip the image if words are included. • Trace the image with Sulky transfer pens. • Iron the image onto a T shirt. • Paint the image with bright colors or in a monochromatic drawing style. Last year, my owls were a hit (see links below), but this year a last minute trip to see them left me with little time to do all original work. Sulky pens to the rescue! Though each one of this year’s designs has something original from me in them, all but one began with a transfer from a coloring book. You’ll find the projects in the photos below. 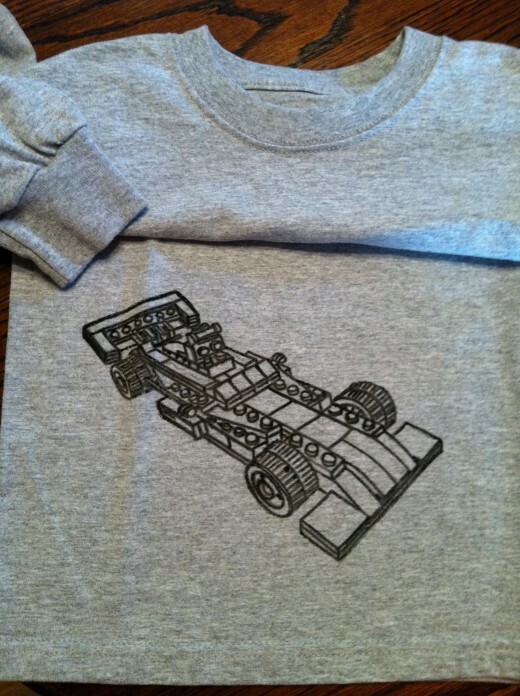 See how easy it is to create something special for your little ones and let me know what you think about this season’s tee shirts in the comments below. I’ll start with the youngest and go to the oldest since I made two designs for him. For the youngest of our little brood I worked from an idea that had clearly been created very simply with the shapes tools of a computer. Simple circles, a triangle, a quote box, and the freehand drawing option allowed me to quickly put this one together and next use a selected font in a text box for my own quote. 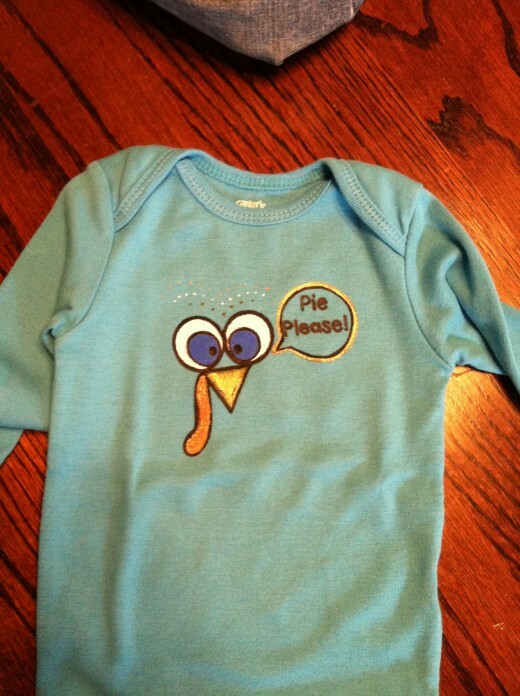 Filling in the geometric shapes with craft paint after the transfer was added to the shirts and adding metallic gold highlights gave this duck egg blue onesie a turkey design for sweet SJ’s first Thanksgiving, who will be 5 months old then. 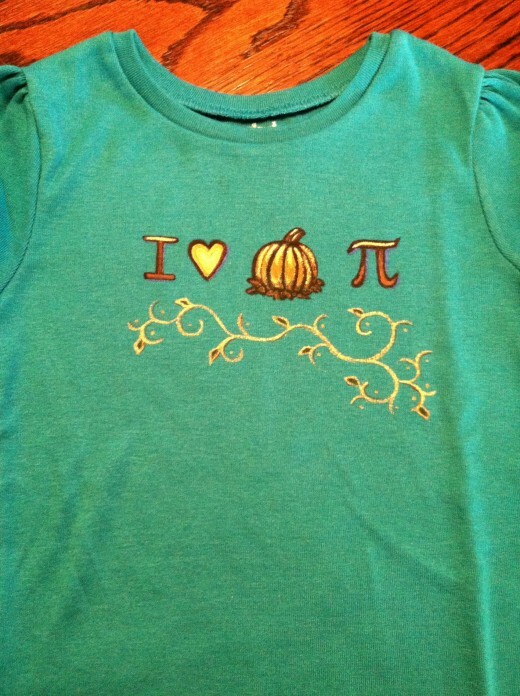 Our delightful two-year-old AG will be announcing how much she likes pumpkin pie in her teal T shirt. 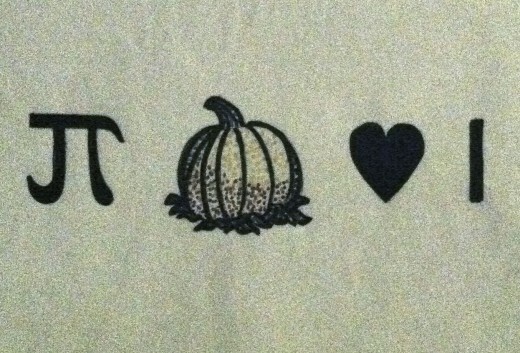 The pumpkin and the π sign were straightforward symbols to find and I drew the I and the heart, as well as the scrolling with leaves. Again, this transfer was effortlessly painted after it was applied to the shirt. The photographed colors are not showing true but this is also highlighted with metallic gold. 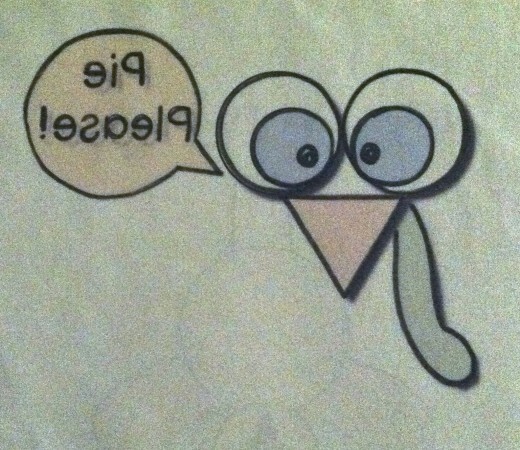 CW is our 3-year-old cute little precious pun’kin and her turkey tells us what she likes, as well. 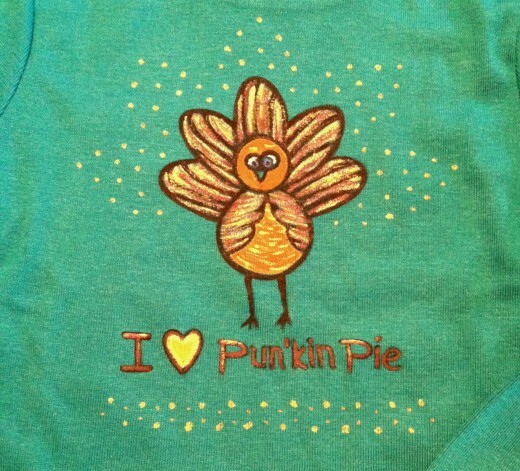 I drew her design and found just the right font for the "Pun’kin Pie" lettering. Gold highlights here, too, with some metallic copper paint incorporated into the dots and lettering. Transferring all of the designs after tracing and painting them, I let the paint dry according to package directions. Then a sheet of paper went underneath and on top to protect from bleed through as I heat set the painted patterns with my iron. 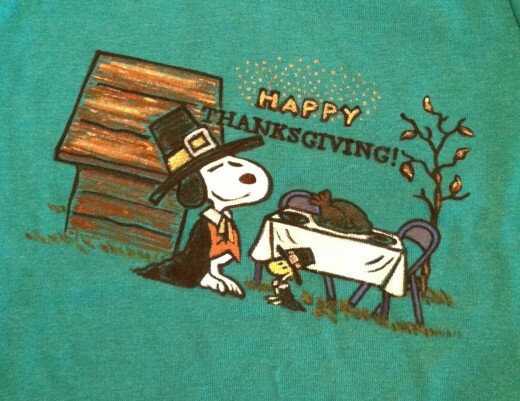 Sugar pie EM, our soon-to-be 4 year old, is old enough to enjoy Snoopy’s Thanksgiving from a coloring book. Sharing a “Happy Thanksgiving!” with others is right up her alley. I did get two for one on this transfer, but I traced and painted them with slight differences (see the 6 year old’s shirt below). Hers has two font styles, for instance, with confetti dots to highlight it. Putting these designs on an angle gave their appearance a bit of depth, and this one does not have as much gold highlighting, which was actually more effective. 6 year old T is quite the big boy now and definitely not into the babyish designs of previous years. 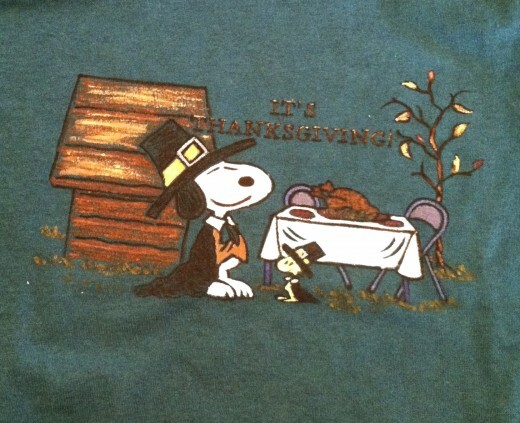 He, however, does like Charlie Brown’s themes so announcing that “It’s Thanksgiving!” made a good to go shirt for him. A little larger and bolder, his design is more masculine, and yet perfect for a great little kid. 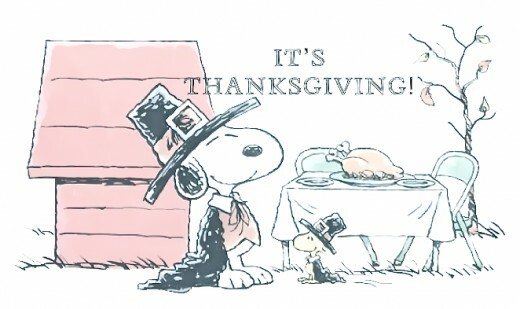 Snoopy will give him a chuckle during the holiday’s season, I hope! He’ll also know that his grandmama was thinking about him as being more grown up. If you like these designs or if a different idea for one strikes you and you get busy creating one, it would be neat to see your work in a hub! T is a lover of Legos--big news for a boy, huh? My Lego car picture is a little askew, but he didn't seem to mind. Much thanks to Pearse for the coloring page that helped me with the idea/drawing! The long sleeved gray tee shirt is soft enough to sleep and play in so I hope T gets a lot of fun wear out of it. Sorry I didn't get a full shot of this one because the design is not center front as the others are. Maybe you can see that it is on the lower right front. The next time I draw him a vehicle I plan to put a road around and up to the back center with a traffic light or road sign design at the end. Are you familiar with fabric painting? Fabric painting is one of my favorite creative outlets. I would like to try fabric painting. I enjoy seeing it, but do not plan to do any fabric painting. • All fabrics should be washed and dryer dried without fabric softener before a transfer and/or paint is added, whether it is a garment or otherwise. Starches in new fabrics will prevent the designs from sticking. • Craft paints mixed with medium make an easy to use paint that is made permanent by ironing after the paint’s dry time is over. Be sure to place a clean paper or cloth under the design and use the same over the top to protect the ironing board cover and iron. Press to set the paint. It is a good idea to have a separate craft iron for this project, just in case you get paint on the iron. • Think through the paint colors you want to use ahead of time, making sure the combinations will give the effect your want to achieve. If it is crucial that colors are true you may want to do a sample project up to make sure the color of the shirt will not affect the outcome. • When using Sulky pens for this craft remember that words must be reversed. I take a photo/screen shot of my final design and use the flip feature on my computer to print it. A light box can also be used when tracing to reverse the words. Any other features of the pattern that you do not want backwards must be also be flipped in the same way. • Though I’ve not yet reused the transfers I’ve created, it is my understanding that they can be reused many times. This would make them extra easy and a lot of fun for parties, family reunions, and more. Kid’s would enjoy seeing their drawn designs on tote bags, and I saw a set of cloth coasters painted with fall leaves--think hostess gifts! 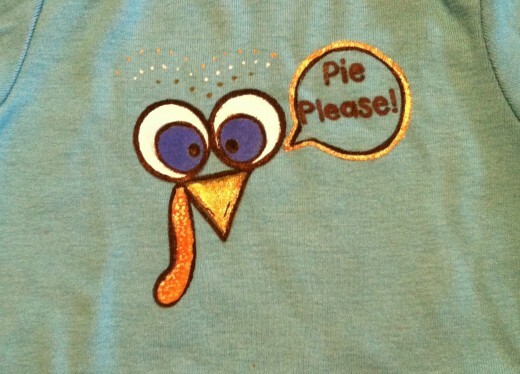 • Thanksgiving, 2012, owls were the theme for four grandchildren’s T shirts. It is lovely that this year I had five shirts to paint! • Fourth of July T shirts, one for a boy and one for a girl. • Toddler sized Fourth of July T shirts. • Valentines Day is a great day for a painted T shirt. 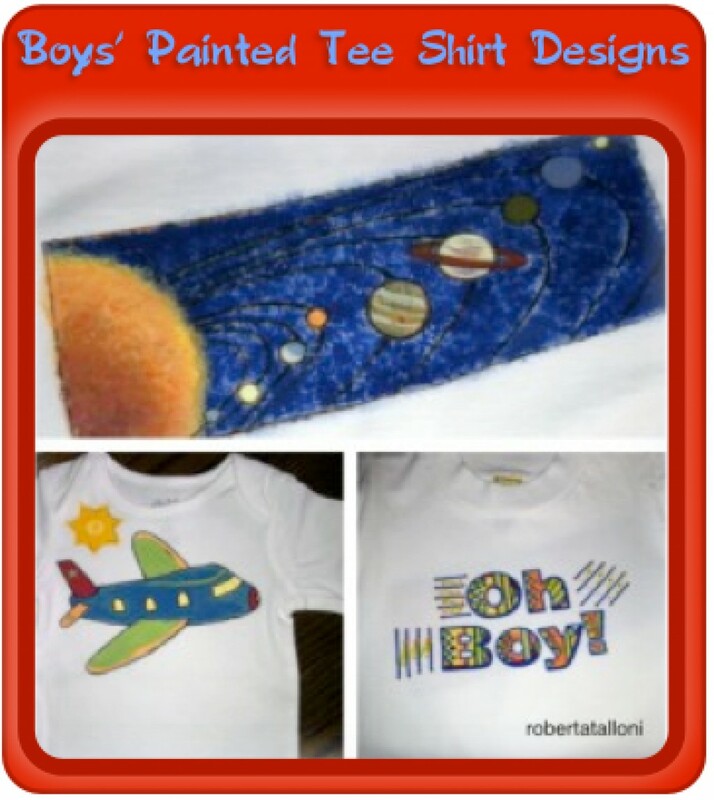 • Even boys can have painted T shirts on Valentines Day. • FAQ's about fabric painting. • Some history on fabric painting/printing. As we work to protect our youngest children from the world's harsh realities (that they will soon enough discover) and teach them gentleness, love, and grace, the need to pray for them is urgent. I've posted some of my work to that end here at HubPages both to encourage other Christians to pray for their own and to share some of my poetry for them with others. I plan to soon post one of these for our brand new grandson. • A love note to T, our first grandchild and first grandson. • With love to EM, our second grandchild and first granddaughter. • With love to CW, our third grandchild and second granddaughter. • A love note to AG, our fourth grandchild and third granddaughter. An interesting look at growing families can be found at this NBC report. A short story look at an innovative foster care idea for children in need. 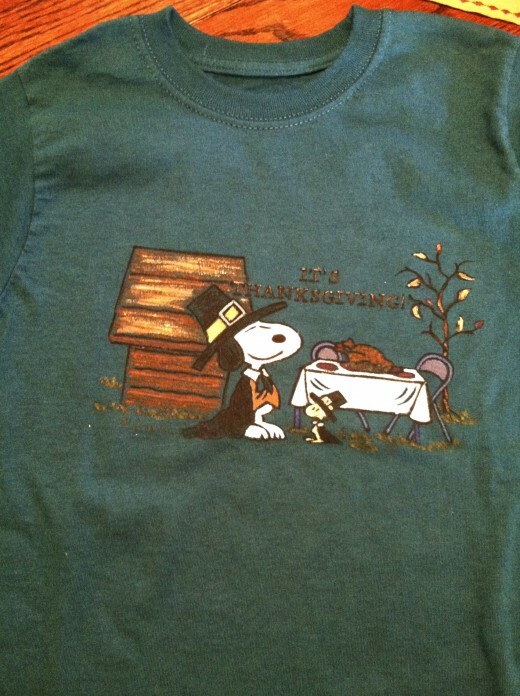 What do you think of this year's Thanksgiving T shirt designs? They were new to me, as well, but I've enjoyed using them. 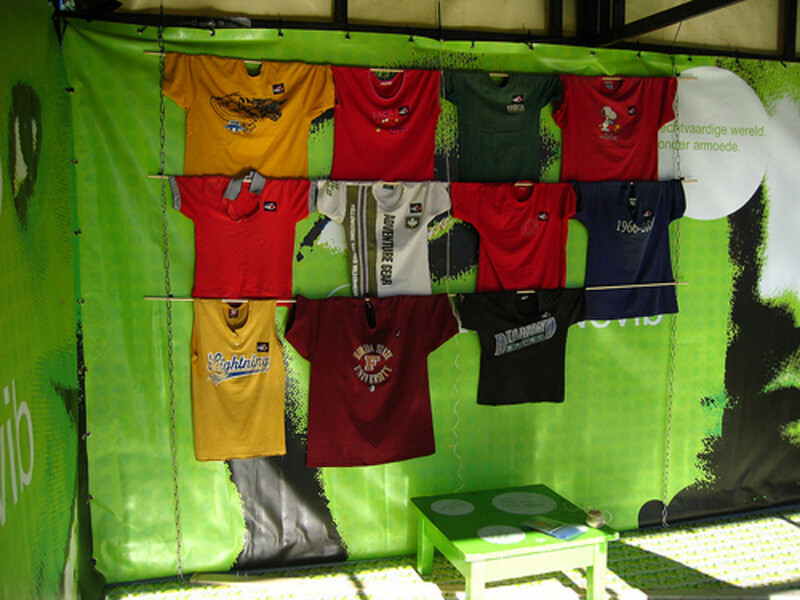 If they are not available in your area, there are many other fabric transfer/paint products on the market. Thanks for stopping in. Wow, such great ideas. Your grandkids must love you very much. 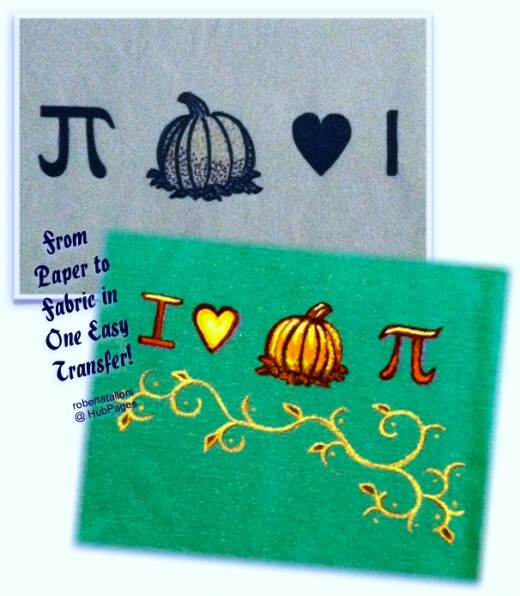 I love all your design ideas for T-shirts, especially the pumpkin one. Rated up. This is such a sweet little project. My daughter will enjoy doing this as she is so very talented in the crafting area. Not so much her Momma. Cool way to make clothes that kids will enjoy. Thanks much for stopping in to check out these projects. I hope you get to enjoy painting some shirts with your nieces soon! 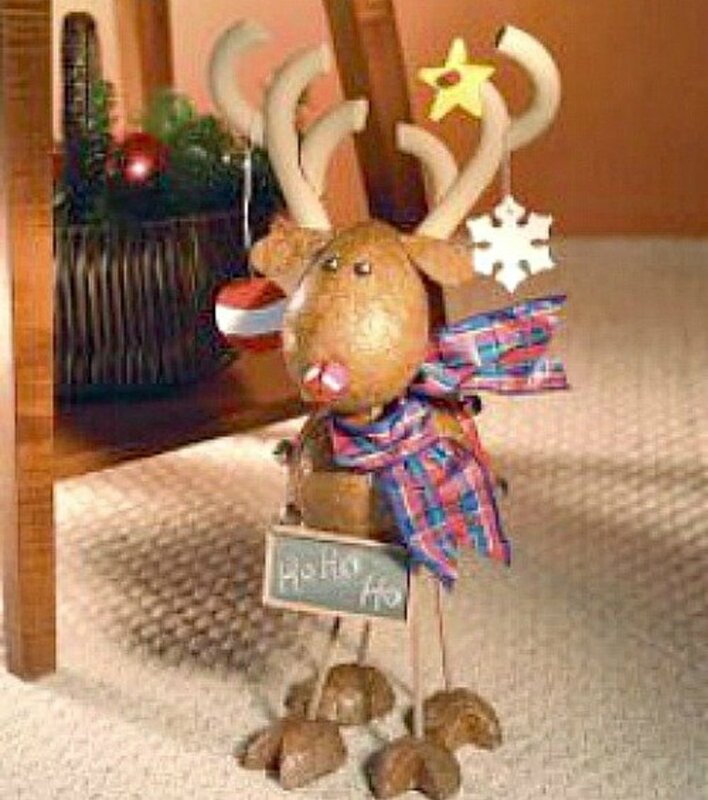 This is a great craft idea for kids. I need to make the time to do it with my two little nieces. I enjoyed reading about the designs your children chose. Thank you for sharing. 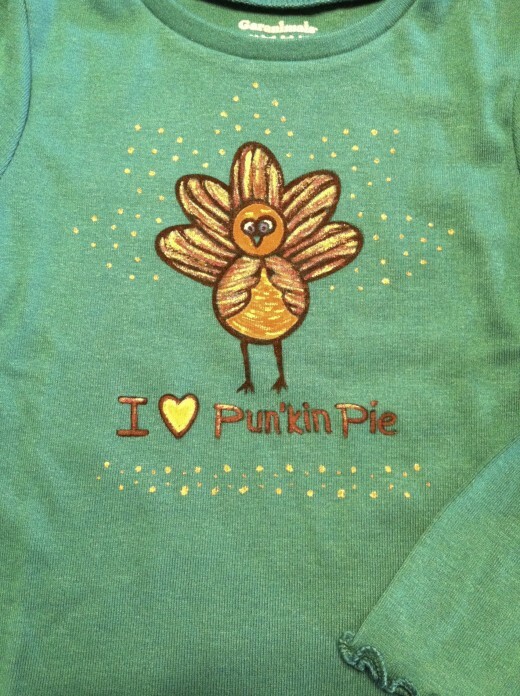 It would be a lot of fun to create a stock of these hand-painted shirts and participate in a craft show. Making time to do that is another story! :) Thanks much for coming by! I am bookmarking this by pinning it. I'll bet that these would do well in craft shows! Before reading your hubs I had never heard of Sulky pens. Thanks! Thanks for your feedback on this tee shirt hub! I hope you get to try the Sulky pens out soon. I'm getting ready to do some winter shirts and thinking through the designs is fun work. Executing them with these transfer pens is the easy part! So glad that your daughter will get to enjoy this craft! Thanks much for letting me know. Really cool! 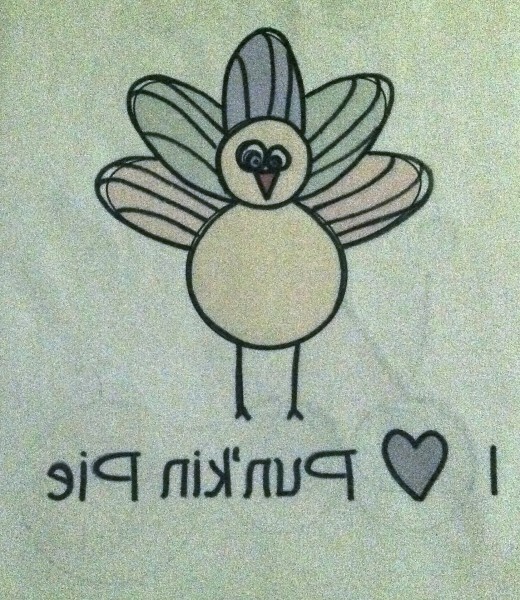 I've never used Sulky pens, but I used to love making shirts with iron ons and puff paint. 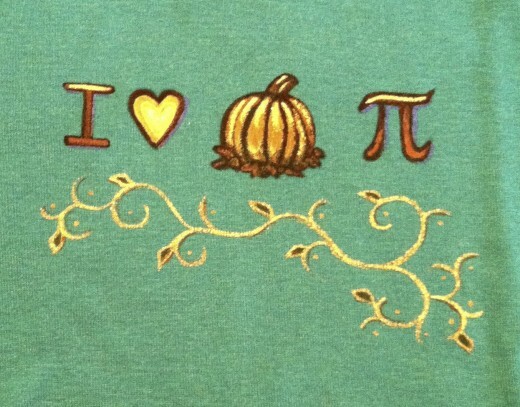 My guy would totally love the I love pumpkin pi shirt. What a great idea and so personalized too. My daughter will love doing something like this! Thanks. Pinned and shared. These are wonderful ideas and just in time for Thanksgiving! 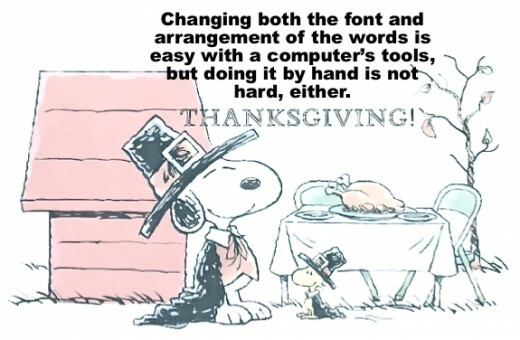 Some of these graphics would work well for tablecloths, place mats and napkins for the holiday table. Voted up. Yes, the crayons can be messy, but these transfer pens are easy, and the transfers are reusable! I've not seen metallic or glitter transfer pens. I used the metallic paints and as with the metallic paints, there are several brands of glitter paints for fabric. I hope you can find what you are looking for in Australia! The method is simple and fun--such a neat creative outlet. Hope you do get to try your hand at this craft soon! 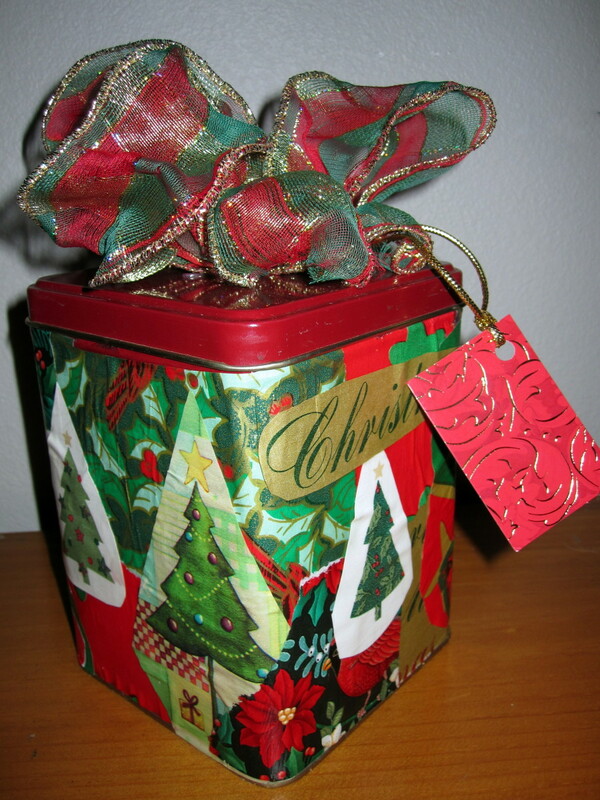 Think outside the box and consider making fabric ornaments or decorations for the holidays. Thanks much for coming by! Sulky pens look interesting. I used to use fabric crayons for tshirt design, but while colourful, they could smear and get a bit messy. I particularly like the idea of using metallic sulky pens for embellishment. Can you get glitter ones? So appreciate your comments on this craft hub--thanks! I am very tempted to try Sulky transfer pens after reading this hub. It sounds so easy and so much fun to use the pens! 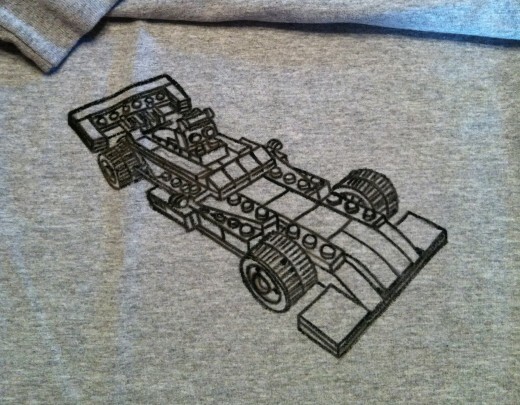 The designs are a wonderful way to personalize a T shirt. Thank you for the instructions. I'll look for the pens next time I'm in a craft store. :) Hope you get to enjoy making T-shirts soon! This sounds like a lot of fun. I feel like I could do this for my grandkids and get an extra hug, too. Thanks. Your instructions are always so easy to follow. So appreciate your feedback on this T-shirt hub! Thanks so much for your kind feedback on this craft hub! I hope the ideas can be used by others as a springboard for developing a project that gives them a creative outlet. Another great hub for my Rainy Day box. Such cue T ideas. If I had the time, I would make myself a couple of these. Excellent article for the upcoming holiday season. You are so clever with all crafts. I miss having young children to make those clever items. This is an excellent hub. You'll have so much memory-making-fun with your granddaughter! Thanks bunches for letting me know you came by and enjoyed seeing this post. It is easier these days--new products make the craft even more fun! Thanks for your kind feedback here, so appreciate your visit. 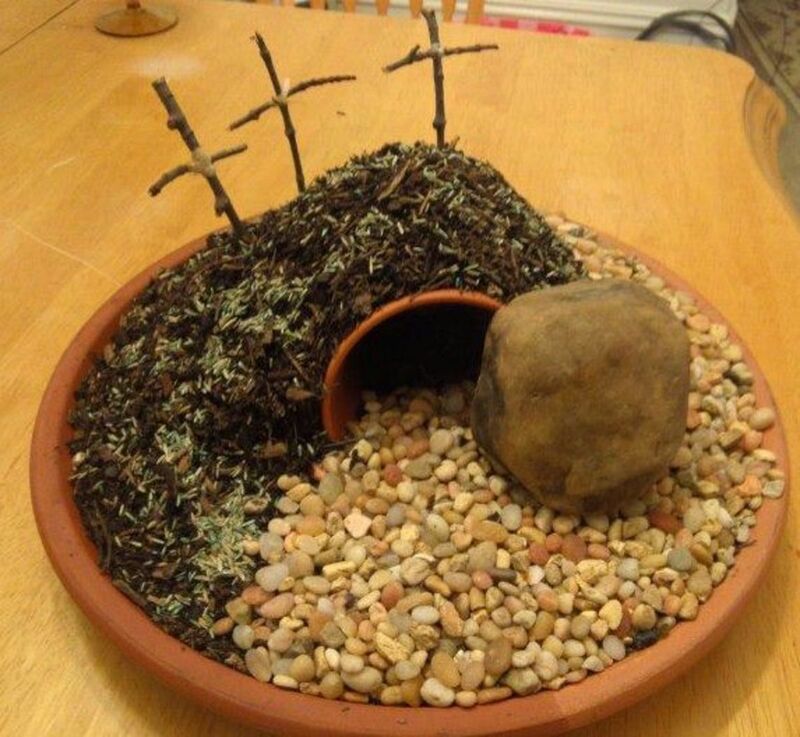 It is a neat craft project to make for others or to do with kiddos. Thanks for your visit and comment! Great hub. I use to fabric paint all the time. I need to get back in it. It's different from what I use to do and easier. Your t-shirts are so cute. Voted up . Thanks, thanks! :) So appreciate your helpful feedback! So appreciate that you checked out this craft hub and left your encouraging comment! Looks very cute and so much fun! Great explanation! This looks so fun. Thanks for the awesome hub! Thanks kindly for your visit and feedback here. Hope you enjoy your mess and make a great memory out of the project! Super duper and fun. I want one. We are going to make a mess here! So be it!